Regular Rate $3896 . Today Only $1197! Perfectly located on the magnificent east coast of the Dominican Republic, the natural beauty of the island and nearby coral reef nurtures an incredible number of flora and fauna. Every detail has been selected for your complete pleasure and total relaxation. 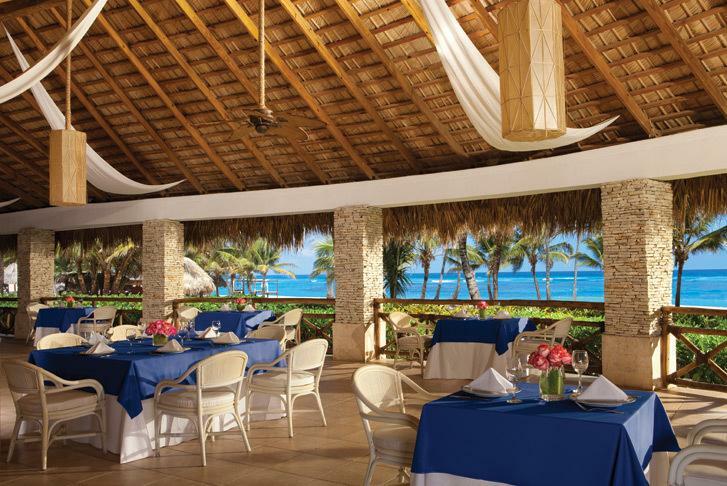 Arrayed on a stunning white sand Atlantic Ocean beach 60 km (38 miles) north of Punta Cana airport, this northeast-coast family resort includes a children's club and an adult-free teens' area. The Punta Cana Unlimited Resort & Spa All Inclusive brings fantasy to life on the secluded beachfront landscape at Playas Uvero Alto in Punta Cana. The resort design angles accommodations away from the beach in rows so that most guest rooms offer views of the ocean. Freeform swimming pools wind throughout the property like Venice canals, lined with rustic bridges and coconut trees. The all-inclusive deal means hassle-free international dining at six restaurants and fun family activities ranging from tennis to an ocean trampoline. All accommodations are luxuriously spacious, airy and bright. Guestrooms feature balconies or patios include ceiling fans plus air conditioning, TVs with U.S./European channels, and refrigerators with soft drinks, water, juices, and beer. Family, children's, and toddlers' pools, water-sports gear, 7 a la carte gourmet restaurants, 24-hour room service, day/night activities, and a disco are among the amazing array of included amenities. You won't have to think about anything except fully enjoying yourself at this up- scale resort! Swim In The Largest Free Form Pool In The Dominican Republic Which Winds Throughout The Resort. Celebrate Sanctuary at Playas Uvero Alto, In A More Remote Corner Of Punta Cana. Enjoy Extraordinary Activities Such As Euro-Bungee And An Ocean Trampoline. Fantastic service! Good amenities, a show every night, a Casino for adults, the swimming pool is huge & never gets crowded! Several bars & restaurants providing lots of choice! We booked into Spa which was amazing so we booked in again the day before we left! Good for couples or family as there is entertainment for all ages! Truly great experience! 7 International restaurants serving gourmet fare including Italian, Japanese, French, Mexican Seafood and MORE Plus 10 wonderful lounges w/ NO Reservations Required! Teen Club (ages 13 - 17) and SPORTS AREA Feature: Daily organized teens entertainment, board games, pool billiard, ping pong, foosball tables, TVs and video games, and much more! Enjoy gourmet dining at this elegant and exquisite French restaurant. la carte dinner: 7pm - 10:30pm; Dress code: Casual Elegance - Long pants and short sleeved shirt with collar required for men, ladies are required to wear skirts, dresses or pants suit. No flip flops allowed. Adults only (18 years and older) / Air-conditioned. Talented chefs using the best local and imported ingredients create a variety of a la carte fresh grilled local and international seafood specialties served in the fresh air palapa located by the beach. Serving a variety of Pan-Asian classics and favorites. Great experience! Resort is awesome. We're having a good, couldn't be any happier. Our 5th day here, we had an AWESOME vacation great food, great service, great entertainment, the fish therapy at the spa was awesome!...BookVIP save yourself a lot of money! "Great resort in Punta Cana"
Service is great. Entertainment staff is awesome. Rooms are clean and comfortable. Food in restaurants is very good with little or no wait time if you arrive early enough (no reservations required). Buffet food is good. Comparable to other Punta Cana resorts. Resort layout is great, compact with not a lot of walking. Grounds look well kept. Beach is excellent, ample palapas. Some seaweed in water only prevalent on windier days with higer surf, but didn't seem bothersome to anyone or any worse than would probably be at any other Punta Cana resort under similar weather conditions, (have stayed at other resorts in the past). On calmer, less windy days, water is almost perfectly clear. No rocks in water and great for kids as the angle of decent is fairly low. Swimming pool is nice - one comment please add more umbrellas to the pool area. They are difficult to find and get reserved quickly from early morning. Paella on the beach, vegetables/fruits and kebabs in the swimming pool area are a great idea - no need to interrupt your relaxation to eat at the buffet. Resort Management is very visible and pays extra attention to things running smoothly and tourist needs. Nightly shows - some are great, some are just ok. Resort very kid friendly and feels safe, great atmosphere overall with a good mix of tourists from different countries - more from US and Canada. Would definitely reccomend this resort and will probably go back next time. Service is great. Entertainment staff is awesome. Rooms are clean and comfortable though outdated (renovation in process). Food in restaurants is very good with little or no wait time if you arrive early enough (no reservations required). Buffet food is good. Comparable to other Punta Cana resorts. Resort layout is great, compact with not a lot of walking. Grounds look well kept. Beach is excellent, ample palapas. Some seaweed in water only prevalent on windier days with higer surf, but didn't seem bothersome to anyone or any worse than would probably be at any other Punta Cana resort under similar weather conditions, (have stayed at other resorts in the past). On calmer, less windy days, water is almost perfectly clear. No rocks in water and great for kids as the angle of decent is fairly low. Paella on the beach, vegetables/fruits and kebabs in the swimming pool area are a great idea - no need to interrupt your relaxation to eat at the buffet. Resort Management is very visible and pays extra attention to things running smoothly and tourist needs. Nightly shows - some are great, some are just ok. Resort very kid friendly and feels safe, great atmosphere overall with a good mix of tourists from different countries - more from US and Canada. Would definitely reccomend this resort and will probably go back next time. I'll start with what was great the staff was over the top. They were friendly, welcoming they remembered our kids names and where we were from, which I have no idea how they did that considering the new faces they see each day. We did the preferred club and it was nice to have a few of the extras wi-fi, an assortment of appetizers all through the day, breakfast and lunch at the sea side grill reserved for preferred guests right at the beach You also get a private check-in and out, however it is not at the lobby, it is at the other side of the resort. When we arrived we really we not sure where to go and there seemed to be a little confusion however if you ask one of the guys at the front steps they will arrange someone to get your bags and take you over to the preferred check in. Once we realized we were supposed to go to another area, we understood what the delay was. The resort is a little older but well maintained. Our room was fine but very clean. They are in the process of upgrading the rooms, however ours was fine. I would say an honest review of a 4 star for the room is accurate. a little dated, but clean, comfy beds, great pillows The pool area was very nice, the vegetation was nice however very well maintained. The food was the part I was concerned with when we booked, as I have been to the DR twice in the past (at other resorts) and the food was awful. This was the opposite. The food at the restaurants was fabulous. Even the buffet was much more that I expected I certainly didn't expect made to order grilled seafood at a buffet and that was one of the items. Breakfast was also great - made to order eggs, waffles, pancakes, fresh fruit, baked goods. so everyone in my family was happy with the selection. Overall, the reviews I read were accurate and I think that the 4 star rating is also accurate. The few items I listed that were a little less than I expected were not enough to offset all that was wonderful with the resort. A special thank you to Minerva at the buffet, Nelson from the buffet and the hamburger grill, CandyMan and Sander in the entertainment team for making our trip extra special and being so kind to our boys!! my husband and I stayed at the punta cana resort and had a blast. the service was wonderful , all the workers at the resort are really hard working and at some times I felt sorry for how hard they were working because they were really going above call to make sure we were comfortable we stayed in building 5 which was ocean view and our butler Wilson and jose were really great. to celebrate our anniversary they dressed our room with flowers and champagne in the Jacuzzi while we were out to dinner. so cute. Ray work in the food department and he was so hard working it's like any one of the restaurant we ate at he was there. the food was great it was actually the first time I took a trip with my husband and he didn't get home sick for our type of food, maybe because of the variety they served. I can't say how appreciative I was with the cleanliness of the place and the effort made by the workers to ensure it stayed clean , the rain fell while we were there and the workers kept running the water off the walkway with a squeezy mop as soon as the rain stopped. I have been to a lot of resorts an I haven't seen anyone taken such care for there guests. I give this resort and it's staff full recommendation and anyone who doesn't really don't know how to appreciate . "Sun, Beach and Fun in Dominican Time." We stayed the week before Christmas, all 10 of us, and we paid the extra for the preferred club. We had a fabulous room with a Jacuzzi and a view of the ocean. From the moment we got there Carlos took excellent care of us. He seemed to always be there when we needed something and always with a smile. But he was not the only one to help, we were pampered at every turn. German, our Beach Concierge, brought us drinks and food right to our beach "bed" and helped us with multiple requests and always with a smile and the best attitude, like Carlos. Even though we were prepared for it, there were really no bugs. Flo Maria and Ray were working at all the restaurants we chose to dine at (when not at the beach) it seemed like they were always there, and each time we saw them they gave us great service and made a great meal even more enjoyable. My highlight of the trip was realized with the help of the very friendly Michael who introduced me to Alicia and my deep tissue massage at the Spa. The experience began at the Hydrotherapy pools (for me it was like a super jacuzzi) and then off to the best massage I've ever had, I actually nodded off for a second. I just can't get over how friendly and cheerful everyone one was who helped us. Our stay at the Punta Cana was like being among good friends, no wait, not friends... Familia! If you are looking for a all inclusive vacation where you and your family will be treated like the most important guest every hour look for in punta cana. We spent 10 days and it felt like 2 days. We have the best food, service and entertaiment we could wish our selfs. We highly recommend this place. "We would go there again in a heart beat"
My husband and I are currently at this resort (Dec 2013) returning home tomorrow. We would love to be spending another two weeks! The girls in the Preferred Club are most helpful and will go out of their way to meet all of your wants/needs. This is not our first trip to a resort , nor will it be our last! Check in painless - room is ready on time! The guys with the luggage take you to your room while explaining features of the resort along the way - very helpful. Love the restaurant set up - no pre-booking so you can go to an a la carte restaurant your first day and everyday thereafter for dinner. That feature alone has us coming back to a resort twice each year. A big shout out to Christina, Ray and Tito at the Sea Side Grill where we have breakfast and lunch every day and often dinner as well. Excellente all of you!! Our favourite place of an evening is dancing under the stars in front of the Bridal Gazebo. They have a wonderful duet singing Latin songs - salsa, meringue and bachata. Love them! They and Elizabeth, the lady servicing drinks there, made our evenings VERY special. Thank you, thank you, thank you all! Very excellente! The Entertainment team are wonderful! Love all of you, but a special shout out to Woody, who danced every evening with me during our stay. Love that meringue Woody - you sure can shake it! Where do you get all that energy? If you love to dance and don't have a partner, no problema the entertainment staff - guys and gals - all will spin you across the floor. They even dance with the children - fabulous. My husband enjoyed dancing with Mathilda (you are a wonderful dancer). Unfortunately for the rest of you, you won't have this same privilege as Mathilda is now working with the Spa folks. She always stops to talk with us every day as she makes her rounds, ensuring all our needs are met! We will miss you Mathilda. Jose is the poolside waiter, and while we are not big drinkers, he is always ensuring we have water, juice, cola or whatever we would like. Much thanks Jose you are excellente! "Puerto Aventuras was truly a fantasy come true!!!" We couldn't have had a better time! The resort was BEAUTIFUL, the staff were super friendly, and everyone made us feel like we were stars! Our wedding was perfect, and worry-free. GREAT food, service, and accommodations! We will be coming back again, hopefully every year! "A beautiful resort w/ plenty of amminities for all ages." I my opinion the resort was very inviting . All the restaurants were excellent & a very nice adults only area. The resort was just my size, everything was easy to get to ( no golf carts needed here).Great value ! We stayed at Punta Cana during the week of Thanksgiving and had a great time. My daughter (8) loved the Explorer's club and my son (11) enjoyed the freedom of exploring the resort on his own. The resort felt very safe and I was very comfortable letting my children come and go as they desired. We enjoyed all of the Ala Carte restaurants but our favorite was Oceana. The resort was at capacity when we were there and there was about a 40 minute wait each night for El Patio (Mexican) and Portofino (Italian). On our last night there, we had little time for dinner after packing. The wait staff at Oceana allowed us to have a table at 10:45pm (15 minutes before closing) and did not rush us through our meal--we were very thankful. We ordered room service almost every day (much prefered room service breakfast over the World Cafe--we were not impressed with the buffet at all) and it was very prompt. We had a loft room on the 3rd floor, dolphin side, and our kids loved having "their own space" upstairs. We spent most of our time on the beach--kayaking, snorkeling, etc. We did visit Xplor Adventure Park and the Coba ruins while we were there however we could have spent all 7 days at the resort and would have had plenty to do. We wanted to walk to downtown PA to see the dolphins but we couldn't find the time. The building is definitely older and repairs were happening however our room was beautiful and the view from the beach was incredible. Thank you, Rebecca for a great week!!! "A very good surprise and great memories"
5 of 5 stars Reviewed 3 weeks ago As my wife and I were trying to get away from the cold weather of Chicago we were searching online to see if we could find something affordable and good. The best part of all is that it was easy to find and easy to decide for. We went through some websites looking for good prices and good reviews. Overall this place looked like what we were looking for: A place to relax, have fun, enjoy nice weather, good location in the Riviera, close to the Mayan ruins, and a more quite place then the opposite. The place is more for someone who would like to take sometime and enjoy themselves. Maybe more like a family thing and kind of away from the outside world. This place will help you forget about everything and enjoy a true getaway time. Everyone is very friendly and they give such a good service. They put the undivided attention on you, and the room service is lightning fast. Might not be as fancy as other places, but once you are there you feel like everyone is just waiting for you to open your mouth or make a bodily gesture so they can service your needs and commands. We loved it, and will definitely come back next year. I had never stayed at a dreams resort before. I loved that you didn't need reservations for the a la carte restaurants. All but one due to staff was great. I found the staff overall exceptionally friendly. Loved the size of the resort and its location. This was my eighth time to Mexico and this would be one of my favourite resorts. We had a total of 23 family members from 3 states stay from November 16th to the 23rd. We had 8 rooms on various floors and NO ONE had any problems want so ever. Everyone was very impressed by all the staff at this resort and their attention to detail. We have traveled the last 20 years either in Europe, Dominion Republic,Jamaica and many other islands and overall always have had a great experience. Overall food and service was excellent. People need to remember when traveling to other countries and keep a OPEN mine to their country life styles.There is currently renovations going on upgrading several rooms. I would highly recommend this resort. This by far the best hotel i have ever been to. the food is great, the services is amazing. I went with my boyfriend for a romantic vacation. it is very peaceful and the beach is beautiful. Many activities on site as well. I would go back tomorrow if i could! "Best Beach I have experienced"
I have been to two other resorts within a year and Punta Cana Beach meets the same high standards. Check-in was very relaxing and smooth, with champagne and cool, wet refreshing towel given on arrival. All staff are very helpful and have a great spirit, which sets the positive mood for the resort. Even the hotel manager said hello, asked how we were enjoying our stay and if there was anything he could do for us. Our room was very spacious and over looked the Punta Cana Beach, which is the best beach I have experienced, soft white sand and very beautiful. There are various restaurants to choose from and I would recommend the Italian and Japanese particular for the evening meal. Regarding facilities, it has several swimming pools, direct easy access to the private beach, water sports (wind surfing, sailing which is included), scuba diving, entertainment every evening, shops, caf, tennis courts, gym, spa etc My fiance and I would recommend this resort to other couples or families. "Fantastic escape for couples and families!" Unparalleled! That one word describes our trip to this fantastic resort! We are frequent travelers, and travel just about everywhere with our 2 kids, age 2 and 4. When we travel, we like it all--outdoor adventure, nightlife, good food, culture and family activities! This resort offers all of these things! The food is exquisite with many different delicious options, including seaside dining. The outdoor activity options are extensive. We golfed, took tennis lessons, parasailed, windsurfed, kayaked, swam, took dancing lessons, learned archery, played beach volleyball, did aerobics, pilates, and learned how to sail. We also did lots of relaxing at the many different pools and by the seaside and spent several days just doing nothing but hanging out on the beach and getting massages at the spa. This resort has an EXCELLENT day and night camp for kids and our children had a great time there--they have many different outdoor and indoor activities and the ladies that work there are very kind and have a gift with children. We were able to enjoy some quiet time while the kids were happily playing at the camp.There is also fun nightlife and late night shows for people who are interested. If I had to pick what distinguishes this resort from others, I'd say it's the SERVICE. The staff found a way to accommodate every single request of ours! We upgraded to the "preferred club" and it was worth every dime! The service is unparalleled! We were spoiled by housekeeping (which came twice a day), waiters who brought food to our room, warm and trustworthy babysitters at the camp, and beach staff who waited on us hand over foot all day at the beach bringing us food and drink. This resort understands service and how to cater to someone who wants to relax! The entire resort is kept immaculately clean 24 hours a day. I have traveled around the world and never experienced anything remotely close service wise. In summary, this place is excellent! Great for couples and great for families. I'd recommend it to anyone in a heartbeat. 5 stars!! Beautiful, exceptional, lush, outstanding, friendly! Just a few words to describe this property! 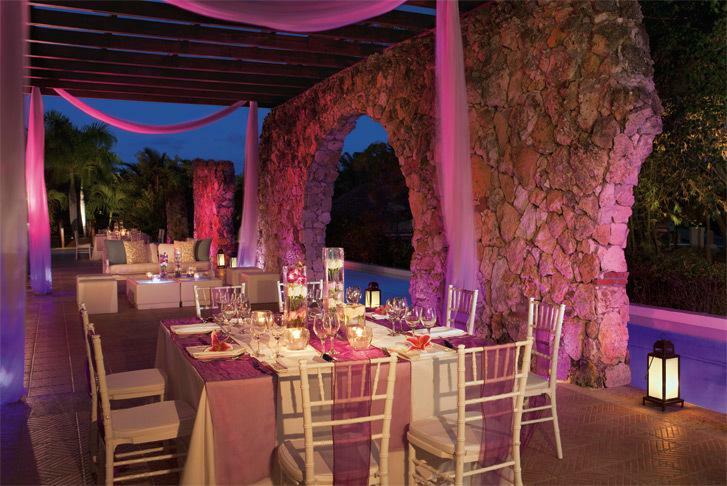 Every aspect of this Caribbean property meets our highest standards. The weather, hot & sunny. Perfect in all regards. We went to this resort for two weeks for our honeymoon in November of 2013 and we had an absolute blast. We stayed in the oceanview honeymoon suite in the Preferred Club and it was so worth it. Our room was huge and lovely.. we had a large balcony with a hammock, a large bathroom (two bathrooms, actually! ), a fantastic jacuzzi.. the room was amazing. We spent most of our time at the Preferred Club pool - we loved it! We had fantastic service from our server Jose (we miss you already!) and Maliena in the Preferred Club lounge. We often would wander over to the other side of the resort to play basketball and bocce. We had so much fun with the Entertainment Team! Candyman, Sony, RedBull and Pololo were a blast! We had such an amazing time and we can't wait to go back! This was the first AI holiday I have booked - and I really was impressed by the Hotel. I'll give a brief breakdown between the Preferred Club and standard bookings, and then go into more detail around the hotel itself. We initially booked a basic room (Tropical View, Block 9). This was quite a small room, and the view of the room was backing on to the back of the resort. We upgraded a couple of nights later to one of the deluxe honeymoon suites in the Preferred Club area - and I was amazed by this Room & the service we got. The suite was outstanding - by far the best room I have ever stayed in. It had two balconies, an ensuite with a jacuzzi as well as a large shower, a large bedroom and living room. Some of the other reviewers have said that there isn't much different if you book preferred club - I would disagree with this, and say that if you have the option to book a preferred room, definitely do this. As a "normal" guest, you get Breakfast and Lunch at the World Cafe, which serves a variety of different foods, buffet style; preferred club breakfast and lunch are at the Seaside Grill, which has a la carte menus (breakfast has cooked breakfast, as well as other cold options, lunch has a selection of burgers and other hot foods). The dinner options are the same if you book preferred club or not (Japanese, Mexican, French, Italian, as well as Seaside Grill and World Cafe. We ate in all the restaurants except the French restaurant. The service in each one was very good, with the Seaside Grill outstanding - especially Nestor and Tito. We didn't attend any of the "entertainment" evenings, as that isn't really our thing, but they did seem to be well attended. Almost without exception, each member of staff was very happy & cheerful from the moment we arrived at the resort ("excellente" being the key phrase used, with the all-important smile to accompany it"). If you get a chance, I would recommend booking this hotel!! Regular Rate $ 3896 . Today Only $1197!